When Before You Quit Your Job was written and published, it was a guidebook for aspiring entrepreneurs. Todaywith the job market in shambles, overseas outsourcing and high unemploymentit can be a path to the salvation so many are looking for: A way take control of their life and use their skills and talents to create their future. Before You Quit Your Job asks: Do you have a million-dollar idea? Are you afraid of failing? Are you tired of making other people rich? Are you sick of taking order from your boss? Are you tired of working hard and not getting ahead? Are you ready to take a leap of faith and change your life? Learn about the B-I Triangle and the 8 Integrities of a Businessbefore you quit your job! Start reading Rich Dad's Before You Quit Your Job on your Kindle in under a minute. This book paints a good picture of what it takes to make it as an entrepreneur. Many of us have only heard about this life, not many have lived it. I recommend it if you are on the fence on which direction you wanna go. 5.0 out of 5 starsRead this book before you launch your business. This book was an excellent book for me since I have been pondering the reality of retiring early from my job and start a stock trading business. Robert Kiyosaki has written a very open and honest book about financial realities he himself has lived through. He explains that in transitioning from an employee to an entrepreneur you are trading "security" for opportunity and freedom. Few people have the ability to stay focused on winning in their business while operating sanely and intelligently without money. After reading this book many would be entrepreneurs may very well go back to the security of a weekly paycheck. Operating any kind of business requires a very long educational process before you ever make a dime. How many readers can work years with out a return on their investment of time and money? The author recommends being a student before ever taking the leap. If you want to open a restaurant then first work in one to learn the ropes. Read books about successful entrepreneurs, especially ones in your chosen field. While being an entrepreneur you will eventually come face to face with your greatest fears and depths of personal self doubt. Unlike being an employee in a corporation you can not hide poor performance, it shows up in black and white on your balance sheet each month. When you are a business owner everyone else gets paid first and you get paid last...if you get paid at all. But he also gives readers the hope that if you are successful you can be a millionaire and live your dreams like he does. After the book gives you a reality check and you still want to own your own business it gives you great advice by way of the B-I triangle. You must be the leader of your business and set the mission for your team. You must have a product that has an advantage over your competition. You will need to protect your rights by having legal advice and help. The development of systems to run your business will have to be created and put into place. There will be a huge need to communicate effectively with your customers, partners, suppliers, vendors, and employees if you are to be successful. Your business must create monthly cash flow if it is to survive its infancy and move on to being a profitable and self sufficient business. If it does not make money by a predetermined time you will have to know when to cut your losses and move on. 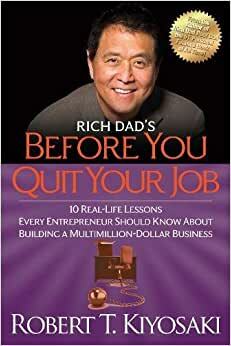 I would highly recommend this book to those considering quitting their job and striking out on their own. Or for those that already have and are struggling to be successful. The book will either make you realize that you are not cut out to be a business owner so you need to shut up and get back to work, or it will give you the tools to strike out and be successful because you value freedom and opportunity more than a paycheck. 5.0 out of 5 starsHe teaches you how to think not what to think. Great read for any would be entrepreneur. Great book, everyone should read this that is thinking about starting a future as an entrepreneur. Great sound advice to guide not what to think but how to think. People always review that his books don't have any answers or explicit instructions thats because there is no step 1-5 to getting a million dollars. His line of books teaches you how to think and how to understand the world around you to make sound decisions. Teach a man to think and he can start from anywhere with anything and work to create an idea and form that into a business. Give a man some steps and they won't know what to do as soon as the steps are done. This guy gets it and explains it really well. It is hard to challenge certain truisms. Either you are musical or you are not. Artistic or not. A born entrepreneur or not. Here, the author challenges that last statement. He clearly affirms that anyone CAN be an entrepreneur, but he then spells out the all-important "BUT"s. But you must become at least competent at a core set of skills or don't even go into business. If you can't sell, you MUST take some readily available steps to learn it. There are no short-cuts here. But there is plentiful clear-cut advice. I had already been self-employed for seven years when I started reading. Within a very few chapters, I learned what aspects of my business were was stalled and how I could break free. One thing has led to another and I now enjoy tackling the necessary challenges. Every day has brought new achievements. Like the "Rich Dad" who mentored him, Mr. Kiyosaki has become a no-nonsense source of advice for people who want to do more than just yearn for a career in business. If you want a cheerleader, DO NOT look here. If you want a fantastic coach, suit up and play. This was a great book with great tips. I am not sure if a book can make a person an entrepreneur, and the author did allude to that but if you do feel inclined and want to start your own business this is an exceptional read.